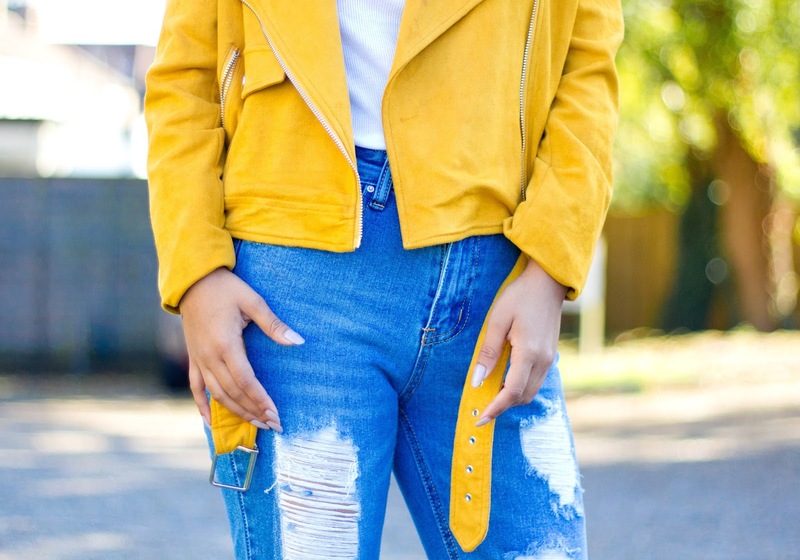 This season, I have surprised myself by craving so many colours in my outfits - and it definitely kicked in when I spotted this mustard number on Missguided. I haven’t had any mustard items in my closet before, so this was something new to add to my colour collection. It's definitely is a great piece to add on top of basic and clean-cut outfits. Today I am going for a Minion colour combination with yellow/mustard, white and blue. My base for the outfit is - no guessing - a white top. I'm a huge fan of the boyfriend jeans and biker jacket combination, and that’s what I went for here, showing my casual, relaxed side. These tan heels also won't hurt, if you're going out. I hope you like the look.